We had company for dinner this weekend and, as I've been so consumed by various projects at work, I didn't have time to plan until Thursday. When I finally sat down to write out the menu, I drew a blank. My pen tapped hollowly on the table. Tap, tap, tap... "What should we have for dinner this weekend?" I muttered more to myself than to anyone else. "Pizza!" yelled Eve from her bedroom. She has the ears of a bat! Of course. Pizza is always the answer, isn't it? That got me thinking. Everyone likes pizza, right? I remembered the Ratatouille pizza I made back in January with leftovers. Hearty chucks of eggplant and zucchini, delicate shreds of sweet basil. I've been meaning to make it again, with a topping that's not too wet, designed specifically for pizza. And so I began planning a causal, relaxed pizza party. Don't get me wrong; this is not you kid's standard, classroom pizza party. I wanted a grown-up party with intense, grown-up flavours. A party where my guests are laid back but the pizza is anything but. Where the laughter flows as freely as the wine; where we eat with our hands, with our elbows on the table, and the conversation stretches long into the night. That's my kind of party! And so I started tossing various combinations of cheese and toppings around in my mind. It had to be something that was a bit unexpected, a bit gourmet. 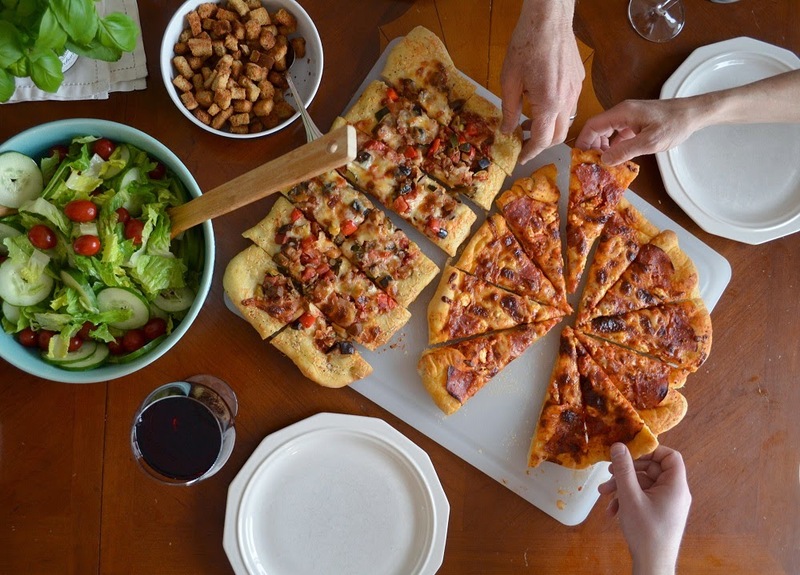 Something that my guests wouldn't soon forget because, let's face it, pizza parties are a dime a dozen. I wanted to make an impression. It wasn't until I finally went to the market Friday morning, and strolled through my favourite section of gourmet cheeses and charcuterie, that the menu became clear in my mind. 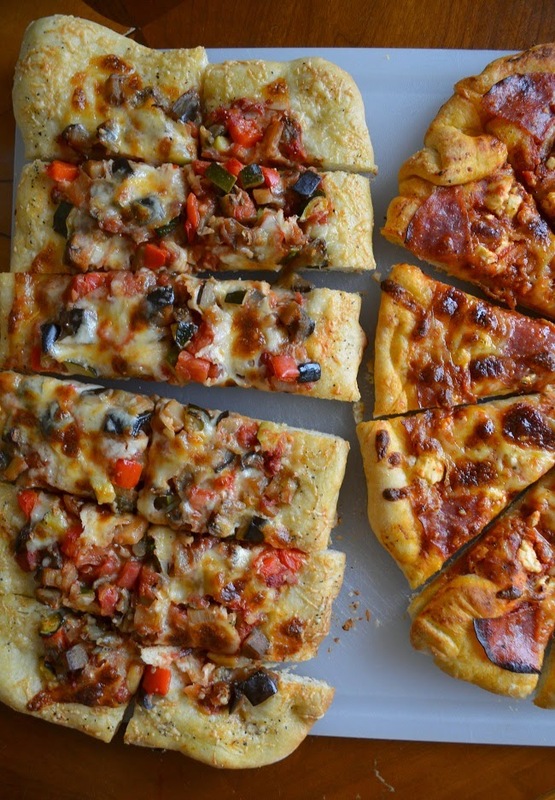 The ratatouille pizza would have a Parmesan and black pepper crust and would be dripping in tangy Asiago cheese. Oh course, when I'm making pizza I cannot forget the salami one that my kids just adore. Like pepperoni only smokier, without as much heat, with a sweet, homemade sauce and chunks of tangy Feta, I know that's what Eve had in mind when she made the suggestion. My impressionable teenage years were spent working in the dingy pizzeria down the street. 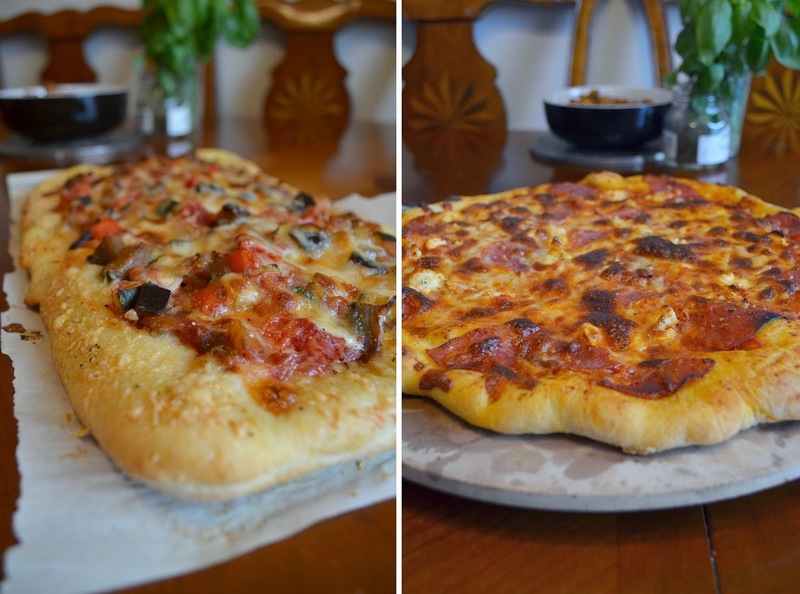 At 16, with oil that clung to my clothes and skin, and the smell of burnt cheese permanently embedded within my hair, I quickly developed a love-hate relationship with the process of making pizza, especially when rushed. But, if you give yourself enough time it doesn't seem quite like work, in fact kneading pizza dough can actually be quite therapeutic after a busy week. I started in the morning, making the sauce and grating the cheese while the dough rose on the counter by the stove. Then everything went into the fridge to be assembled just before my guests arrived. Easy as pie. As far as wines go, my brother brought a California Merlot that was just spicy enough to stand up to the pizza. He really has a knack for choosing the perfect wine for the perfect occasion. And if my guests slept as well as I did that night, I know my grown-up pizza party was a smashing success. In a large bowl, mix the flour, yeast, salt, and sugar. Pour in the warm water and a glug of olive oil (about 1 Tbsp. but I never measure) and mix with a wooden spoon until the dough comes together in a ball. If the mixture seems too dry, add a tablespoon of water. If it's too wet, add a little more flour. Place the dough on a clean, floured surface and knead until it forms a nice, smooth ball. 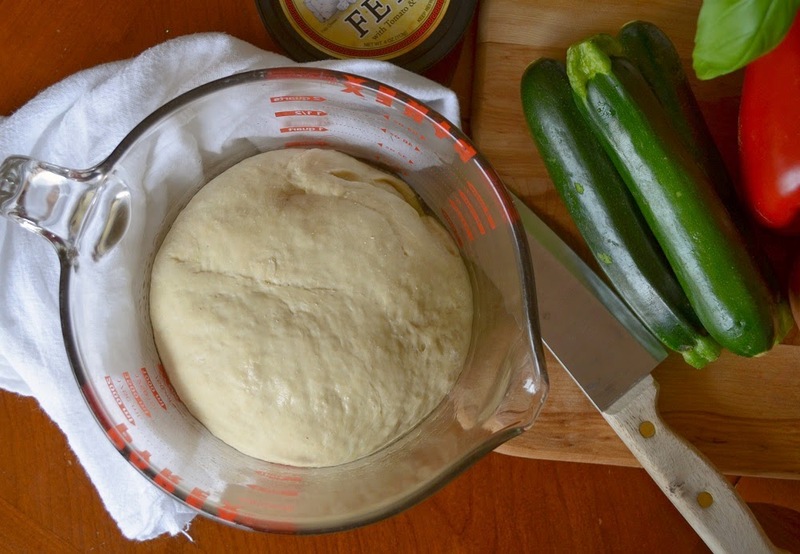 Place the dough in a clean bowl that has been greased with a little more olive oil. Cover with plastic wrap and then a kitchen towel and allow to rise in a warm area until doubled in size (about 1 hour). Dump the dough out on the same floured surface and divide into two equal pieces. Wrap each piece in plastic wrap and let them rise another 10 minutes, or place in the refrigerator until ready to use. Let the refrigerated dough sit at room temp for at least 20 minutes before using. In a large skillet heat the oil. Add the onions and cook until soft, about 5 minutes. Add the garlic and cook for an additional minute. Stir in the eggplant and thyme and cook until the eggplant is just starting to become tender. Add the zucchini and bell pepper. Cook an additional 5 minutes. Stir in the tomatoes, sugar, and salt and pepper to taste. Cover and simmer until the veggies are tender, 5 - 10 minutes longer. Stir in the basil and set aside until ready to use, or cool and refrigerate for up to 2 days. Makes enough to top two 14 inch pizzas. Preheat your oven to 475 F (250 C). If using a pizza stone, place it in the oven to preheat, too. With the heel of your hand, press the dough into a 14 inch round or a rectangle that's approx. 13 x 8 inches. Place the crust on a baking pan that's been sprinkled with cornmeal or, if using a pizza stone, place the crust onto a pizza peel that's been sprinkled with cornmeal. Mix together the grated mozzarella and Asiago cheeses. Spread a handful of cheese onto the crust, leaving a one inch border around the edges. 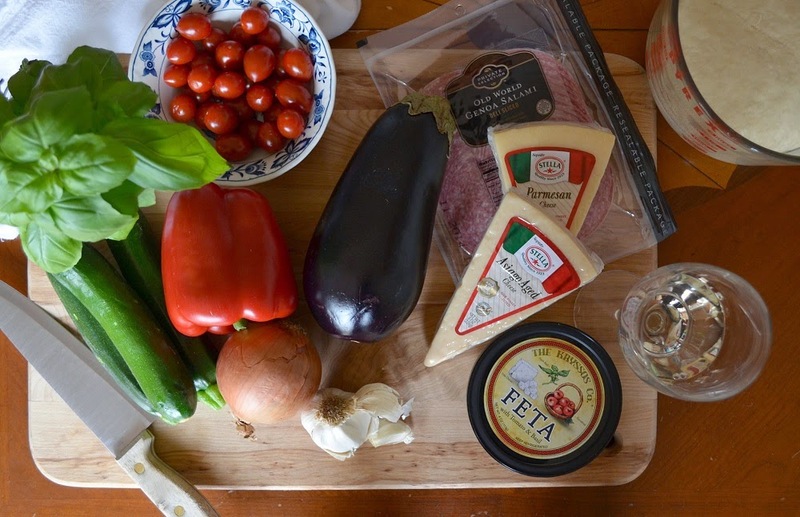 Spread half of the ratatouille over the cheese, and top with the remaining cheese. Brush the edges of the crust with olive oil and sprinkle with the black pepper and the Parmesan. Bake until the crust is golden, 15 - 20 minutes, watching carefully so it doesn't burn. Preheat your over to 475 F (250 C). If using a pizza stone, place in the oven to preheat, too. With the heel of your hand, press the dough into a 14 inch round or a rectangle that's approx. 13 x 8 inches. Place the crust on a baking pan that's been sprinkled with cornmeal or, if using a pizza stone, place the crust onto a pizza peel that's been sprinkled with cornmeal. Spread the pizza sauce over the crust, leaving a one inch border around the edges. Top with a handful of mozzarella cheese. Arrange the salami pieces and Feta neatly over top. Top with the remaining mozzarella cheese. Brush the edges of the crust with olive oil. Bake until the crust is golden, 15 - 20 minutes, watching carefully so it doesn't burn. In a small sauce pan, heat the oil. Add the tomato sauce, water, and pressed garlic. Bring to a simmer. Stir in the oregano, basil, sugar, and salt and pepper to taste. Simmer, uncovered until thick, 5 - 7 minutes. Set aside until ready to use or store in the fridge for up to 3 days. Can't wait to try that Black Pepper-Parmesan Crust this weekend. Thank you!